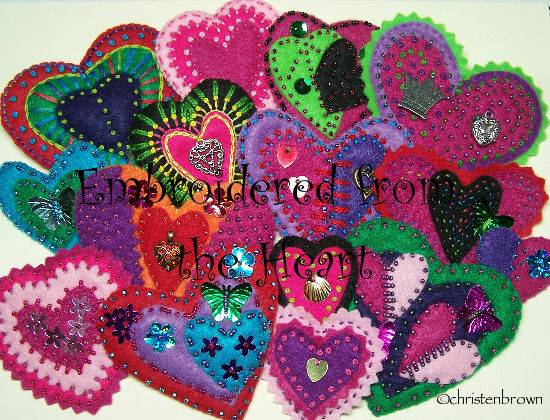 Do you love hearts and embroidery as I do? These lovely little ornaments are perfect for any holiday or gift from the heart! 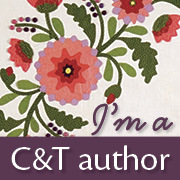 Whether you are an experienced embroiderer or a beginner this class is for you. 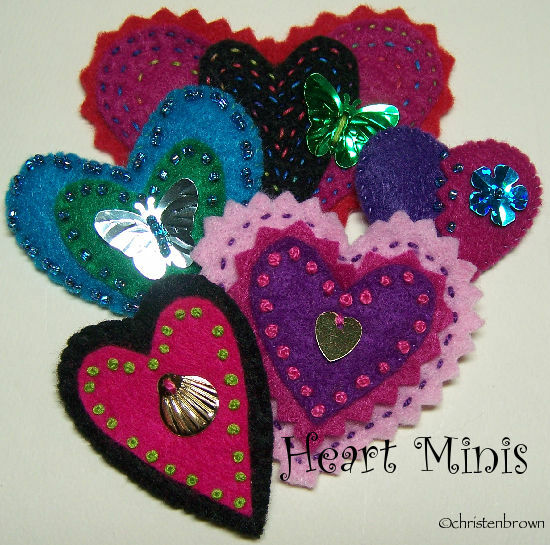 There are five basic heart shapes with thirteen different sizes. There are fifteen designs; ten ornament size and five mini ornaments. All you need to create these lovely ornaments are a few basic embroidery and beading techniques and a little bit of imagination. Lesson 1: This class will cover the cutting techniques, which include straight and pinked zigzag edges; pinked zigzag strips and reverse appliqué. The embroidery stitches include: chain stitch, single feather stitch, blanket stitch, lazy daisy, French knot, straight stitch, single beads and seed bead groups. Stabilizing and assembly directions are also included. The directions and designs for heart shapes 1 – 2 will be covered. Lesson 2: This class will cover the additional cutting and stitching techniques, which include harlequin piecing, patch piecing, stuffing, couched and laid threads. 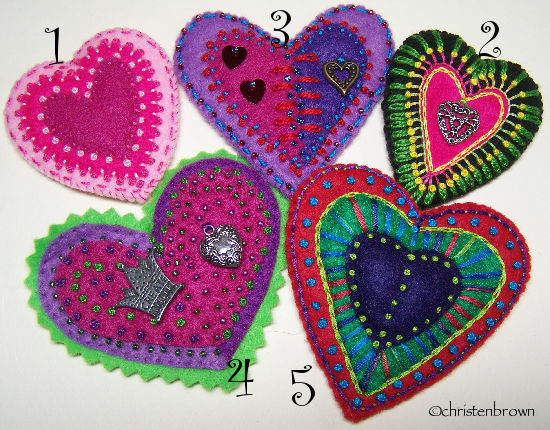 The directions and designs for heart shapes 3 – 5 will be covered. Maria had just left the fortune teller’s shop when a dashing young man stopped her on the street. With the words of Madame Travina ringing in her ears”Romance and passion are waiting for you just outside the door!”, Maria boldly grabbed the stranger and kissed him. As he grabbed her waist, and kissed her back she thought Madame Travina was right, she was romantically swept off her feet with passion! Originally Joseph (the dashing young stranger) had stopped Maria just to ask her for directions, oddly enough to Madame Travina’s shop. As he found himself kissing Maria, he thought he wasn’t in that much of a hurry, and kissing was always a good thing! This is my entry for Mixed Media Monday’s “Romance” challenge. This is a collage of greeting cards, art paper, painted paper, gold and black ink pen, vintage velvet flowers, vintage lace, vintage beaded strands and tin hearts. I love hearts, I love the shape, I love to decorate the house at Valentine’s Day, and I have a lot of hearts… so I decided to post A Heart a Day up until the 14th of the month.